American lawmakers from both the Democratic and Republican parties have blasted US President Donald Trump following the resignation of Defense Secretary James Mattis over policy disputes. Mattis announced on Thursday that he would resign from the post at the end of February, writing in a letter to Trump that he deserved a secretary whose views were “better aligned” with the US president. 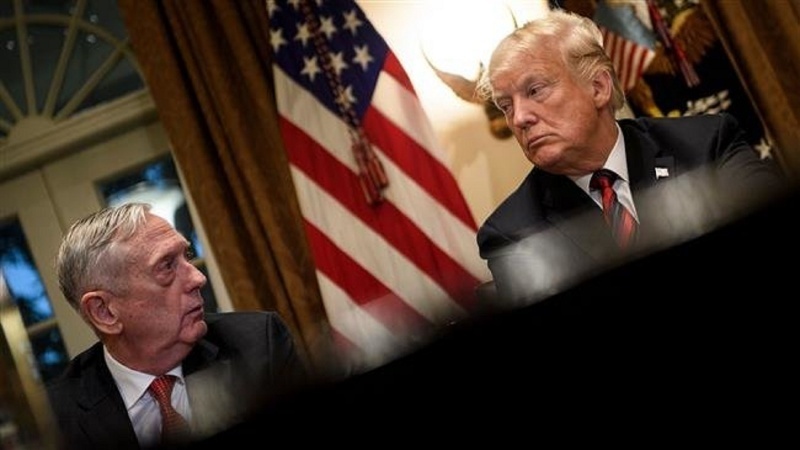 The resignation of the Pentagon chief came after Trump confirmed he was withdrawing US troops from Syria despite opposition from allies and top US military officials. The US president has also ordered the start of pulling out some 7,000 troops from Afghanistan, about half of the total number of American boots on the ground in the war-torn country. Senate Democratic Leader Charles Schumer described Mattis as one of a few symbols of strength and stability in the US administration. “President Trump is plunging the country into chaos. The market’s down another 500 points, General Mattis is stepping down and we know he has real disagreements with the president in Syria and on the wall,” Schumer said. “Everything that indicates stability, everything that indicates strength, everything that indicates knowledge is leaving this administration,” he added, referring to the departures of Mattis and White House Chief of Staff John Kelley. Democratic Representative Nancy Pelosi, the Minority Leader of the House of Representatives, told reporters on Capitol Hill that she was “shaken” by the news of Mattis’ resignation. “I’m shaken by the news because of the patriot that Secretary Mattis is. I think everybody in the country should read his letter of resignation,” she said. “I am shaken by the resignation of General Mattis. For what it means to our country, for the message it sends to our troops, and for the indication of what his view is of the commander-in-chief. Senate Republican Majority Leader Mitch McConnell said he was “distressed” by the US defense secretary’s resignation.